Don’t bother with 11/22/63 by Stephen King. I think King is a talented author and have enjoyed the books of his that I’ve read, but this story wasn’t worth the time. Definitely not worth the time it takes to read 880 pages. This is the story of Jake Epping, a man living in Maine during the year 2011, who finds himself pulled into a plan to stop the Kennedy assassination from happening in 1963. How will he do this when he hadn’t even been born by that year? Through a time traveling portal of course. It’s an interesting idea, and the book is pretty well written, but its just WAY too long. The story backtracks over and over again and although I wanted to learn whether Jake accomplished his mission, I found my mind wandering on multiple occasions. For those interested in the Kennedy assassination, and all of the conspiracy theories out there, this may be just the book for you! I wouldn’t recommend it to many others though when there are so many other great books out there and so little time to read them. That’s my main problem with King. He has great stories, but he takes so bloody long to tell them that I find himself not willing to put forth the effort to read him. I totally agree! I thought the book was good but not worth the time so I will probably avoid is huge novels for awhile. I’ve been wanting to read this book and I’m bummed that you didn’t care much for it. This makes me think twice about picking it up. It’s definitely well written and could be a great choice if you have the patience for it! I just thought it could have had more of an impact if it was shorter..
Hmm…this one was on my eventual list (meaning I’ve got too many books ahead of it to last me the next six to ten years). Was the backtracking necessary, do you think, or was it simply just filler? How much could he have cut? Even though I’ve read five of his books (including “On Writing,” but not including any of the horror stories), I haven’t actually read the super long ones, but I hear they all have a similar problem with a lack of editing. The ones I did read seemed polished well enough. I know his writing style has that “journalistic” approach, in that he’ll simply “transcribe what he sees as it happens.” I can see where this has the potential to take a story off the rails a little. He recently had a forty-minute interview with Lee Child about the Jack Reacher series, and Child joked about how (paraphrasing here) his editor might recommend a scene serving the story better if it were to go elsewhere, and he would respond to him that even though the scene would probably fit better elsewhere, that wasn’t where it had happened; it happened where he wrote it. King basically laughed and agreed with him. I do think that the organic style potentially opens up some interesting possibilities for a story, and sometimes that means taking the story to a much different ending than what was intended. If he’s writing an 880-page time-traveling book about an event that’s already been archived, fictionalized, televised, and movie-ized (filmed), then he’s probably feeling his way around the story to find that unique ending. Did it come across that way in the reading? I do enjoy a good invested story, and 900 pages, while not ideal, won’t quite scare me off…not immediately. But I agree that some story control is necessary with so many other (shorter) books vying for attention. I’ve been pushing it and books like “Infinite Jest” perpetually down the list almost entirely because of the length. But, I did enjoy the shorter works of King’s that I’ve actually read: “Running Man” (one of my favorite 80s movies, though nothing like the book), “Joyland” (probably my favorite of the King books I did read), and the first two Dark Tower novels, which are relatively short compared to the rest of the series. The fact that I haven’t moved on past Book Two of the latter-mentioned series may be indicative of this battle with time and attention span, which translates into a battle of interest. I think each of these stories is relatively tight, though I admit that “Joyland” is the only one to feel like a traditional novel. Regardless of length or story goal, however, I can’t deny that he has an authentic voice that serves his stories, and more importantly, his individual scenes well. He seems to know how to integrate historical references, cultural (and pop cultural) themes, and fully fleshed-out characters with ease. And his sense of vocabulary intimidates me. Who has a memory for so many definitions of words? Human dictionary. I didn’t think I’d have so much to say, but your caption says you’re making a book club, so I figured you’d want the discussion points. 🙂 And, you may have already noticed, but your journal title says 93, not 63, FYI. I love all of the discussion points! That’s exactly what I would like for this blog to be, a place to share thoughts/ideas/opinions! As far as the books goes, I think it could have been a couple pages shorter without loosing any of the important passages. Without giving away too much, the time traveling set up causes the main character to backtrack through time quite a bit. I understand why he needed to do this, but it made me antsy to re-live some of the scenes. I also think King dwelled too much on unimportant scenes that I think contributed to the overall story. If you have the patience for a book this long you may really enjoy it! Like you, I have so many books on my TBR list, that I found myself wanting it to be over so I could read a new book. Thank you for mentioning the the title fix too! I loved the story, but 100% agree that it could have been shorter. King could have cut out about 300 pages and it would have been perfect. I absolutely agree! It’s a good story and well written but it drags on in many parts! Unfortunately, I think King’s last great book was Lisey’s Story. Doctor Sleep was such a huge letdown that I haven’t been interested in his new stuff. I miss his old style. It’s frustrating because there is so much hype about his books too. I haven’t read Lisey’s Story though so I’ll have to look it up. I’ve always loved Stephen King’s short stories, but usually find his novels (outside of the Bachman books) hard to get through. 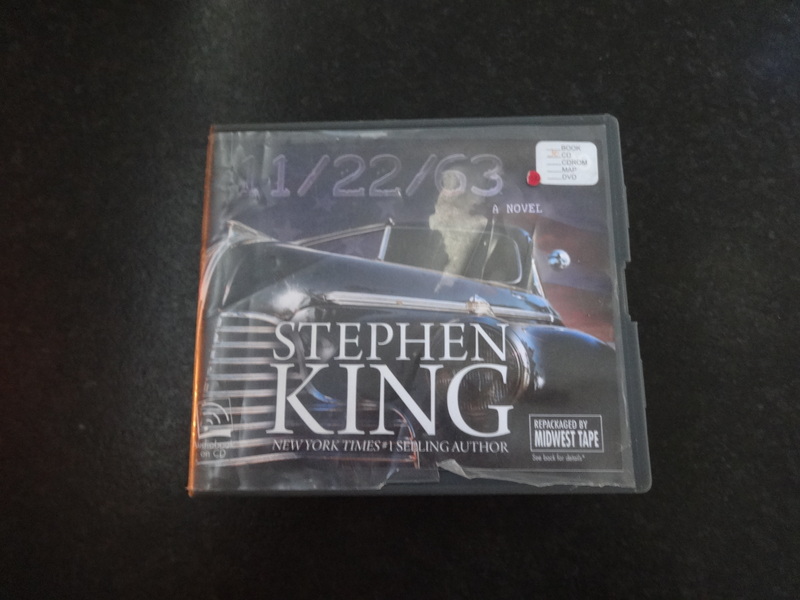 11/22/63 is actually one of the few King novels I’ve completed in full, and I have to agree with you, the payoff really isn’t there considering the obnoxious length. I was hoping he would put a new spin on one of the more clichéd science fiction plots, but he pretty much followed the convention. Then there was that high school musical with the football player. Don’t get me started on that. All in all, I’d recommend watching the “Profile in Silver” episode of the “new” Twilight Zone from the 1980s and leave it at that. I’ll have to check out the Profile in Silver though. Thanks for commenting! You make some great points. Thank you for this review. I think you just saved me some money! That’s a good point, I thought that the ending of the book was pretty rushed as well and didn’t seem to flow with the rest of the book. Maybe I’ll check out his short stories/novellas next times instead! If a book feels too long, it is. I have read double-size novels and still dreaded reaching page 1027.